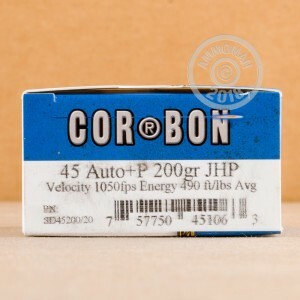 If you want to soup up your .45 ACP pistol and don't mind a little extra recoil, try this +P ammunition from Corbon. These cartridges fire a medium weight 200 grain jacketed hollow point bullet at a high muzzle velocity of 1,050 feet per second. They will perform especially well in full-size firearms like the SIG P220 and .45 Auto versions of the 1911; the added wieght of these handguns helps dampen the extra felt recoil. 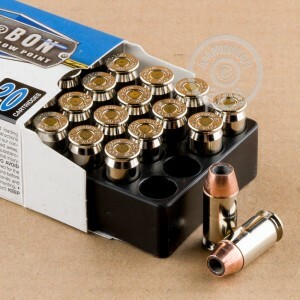 This ammunition benefits significantly from its high pressure loading; a higher velocity increases the round's ability to expand and allows the high caliber of the .45 platform to shine. Corbon ammo is loaded in Sturgis, South Dakota using non-corrosive Boxer primers and brass cases. 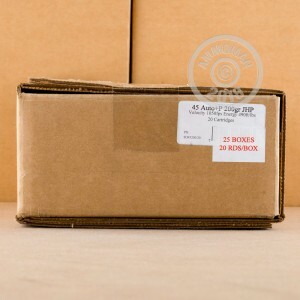 Be sure to grab a few of these 20 round boxes or combine your order with other items to maximize your savings. If your order total exceeds $99, we'll provide free shipping!